On the evening of Saturday January 12th a fire emerged from the second floor of Chapel by the Sea Funeral Home. 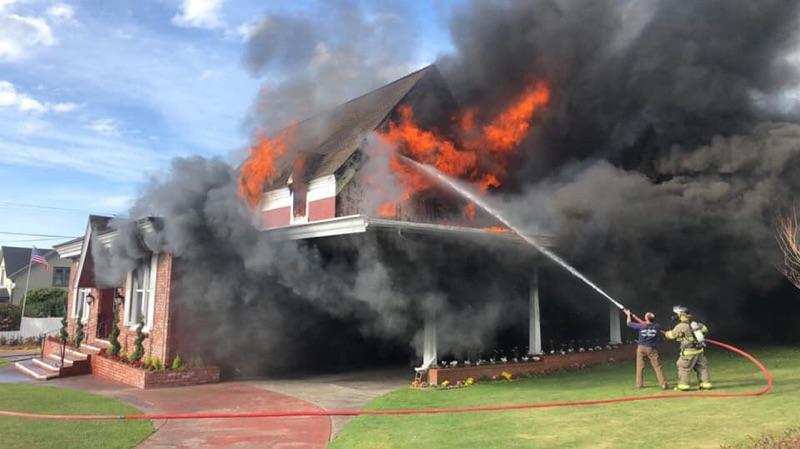 Fortunately first responders were able to arrive promptly to tackle the flames and preserve what they could of our beloved funeral home. Despite severe damage and financial loss we are grateful that no one was injured during this event. Chapel by the Sea has been proudly serving the city of Fort Bragg and North Coast since the early 1900s. Our plan is to rebuild a very similar building in the same spot it has been for over 100 years so that Chapel by the Sea can continue to serve families of the North Coast for the next 100 years! Will You Rebuild In The Same Spot? Yes, our plan is to rebuild a very similar building in the same spot it has been for over 100 years so that Chapel by the Sea can continue to serve families of the North Coast for the next 100 years! Yes, we remain open to make sure we are there for anyone that needs us. We are asking the public to donate any copies they may have of our original building's interior and/or exterior. We appreciate your help!